Making music in a large venue in front of thousands of people is no stretch for the band, called the Spirit of San Antonio. At 250 strong this year, its fourth, SOSA regularly works Roadrunner football games in the Alamodome, a massive space that’s been the performance home for the Rolling Stones, Carlos Santana, Paul McCartney, and KISS as well as the Ringling Bros. and Barnum & Bailey Circus. Ellis is no stranger himself to working on a grand scale, either. 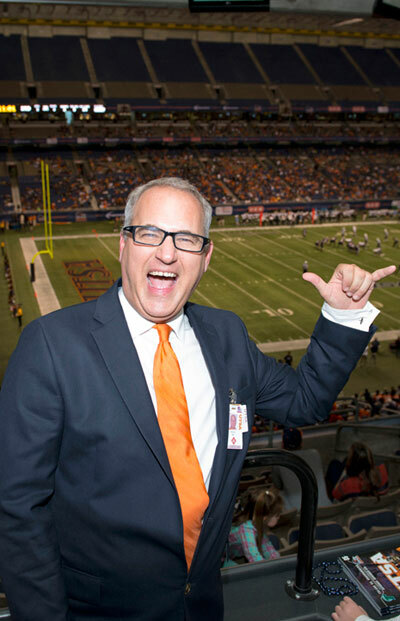 Now in his fifth year as UTSA’s director of bands, he has led music-making aggregations from Florida to France. In addition to his UTSA role, he has been a music director at Disney World in Orlando, Fla., since 1996, and has also plied his trade at Disneyland Paris. After SOSA was chosen to participate in the D-Day commemoration, Ellis and about 50 of the student musicians who were to make the trip had to go into overdrive, learning the music to be performed -- including the national anthems of multiple countries played the exact way they’re played by military bands and raising money to fund the trip. Please keep all comments constructive and relevant to the articles you're commenting on. Sombrilla reserves the right to delete or edit messages. Sombrilla Magazine is produced by University Communications and Marketing, the official news source of The University of Texas at San Antonio.